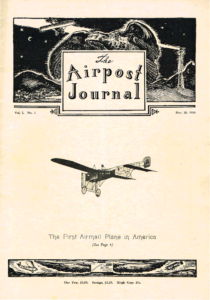 The Airpost Journal has been supported and published by the AAMS since October 1930. The APJ is a generously illustrated magazine covering a wide range of aerophilately. AAMS news appears regularly to keep members apprised of the organization. Feature articles, written by leading scholars in each field, are published each month, along with regular columns of a continuing interest. Through APJ advertisements, collectors can find reliable dealers who can be most helpful in adding new stamps or covers to their collections and in keeping them in touch with current market trends. Copies of articles from the APJ can be obtained for a fee from the American Philatelic Research Library located in Bellefonte, PA (http://stamps.org). Other philatelic libraries also carry the APJ. A scanning project is ongoing with scanned APJ issues placed below. This collection holds back the current year for non-Members. Note: Digitizing of APJ is an ongoing project. If you would like to help please send a message to the AAMS Webmaster.